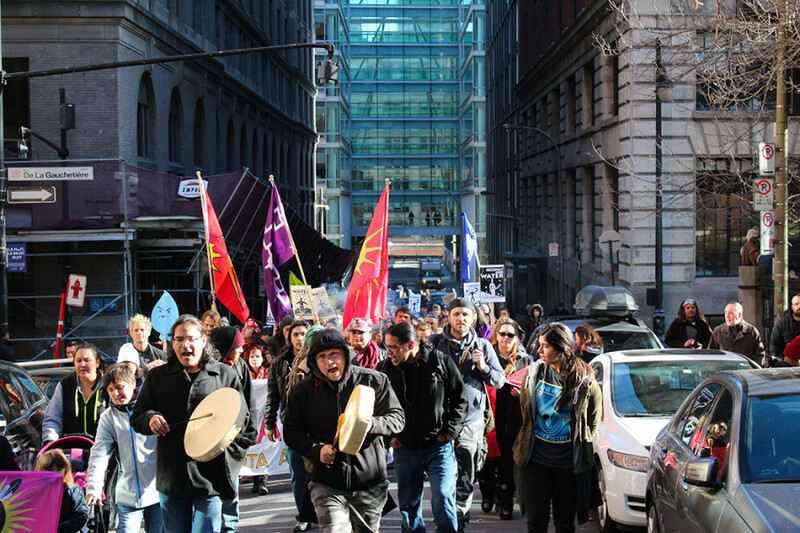 Behind a row of Indigenous drummers and throat singers, around 700 people protested against the Dakota Access Pipeline in Montreal on Monday afternoon. They had gathered to show solidarity with the Indigenous-led struggle. The protest began at noon at Square Victoria, and moved through Montreal’s financial district before finishing at around 2 p.m. near Place Ville Marie. 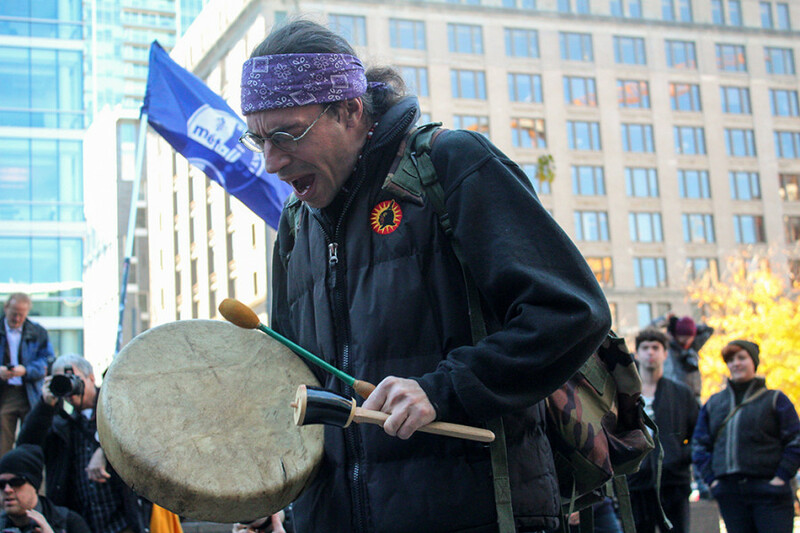 Organizers chose that location as it hosts branches of three banks that fund the pipeline: TD, Scotia Bank, and RBC. Protesters entered the banks to shut down their accounts. Out of the total $3.8 billion cost to build the pipeline, $3.75 billion is credit, according to a report by Food and Water Watch. TD Bank has invested $365 million directly in the pipeline, and RBC and Scotia have $341 million and $100 million, respectively, invested in a corporate owner. If constructed, the Dakota Access Pipeline would be nearly 2,000 kilometres long, stretching from the Bakken shale formation in North Dakota to an oil depot in Illinois. It would have a capacity of 450,000 barrels per day, carrying fracked oil to market and allowing for an expansion of extraction activities in the Bakken shale. The pipeline was originally slated to pass through Bismarck, North Dakota, but local residents refused. 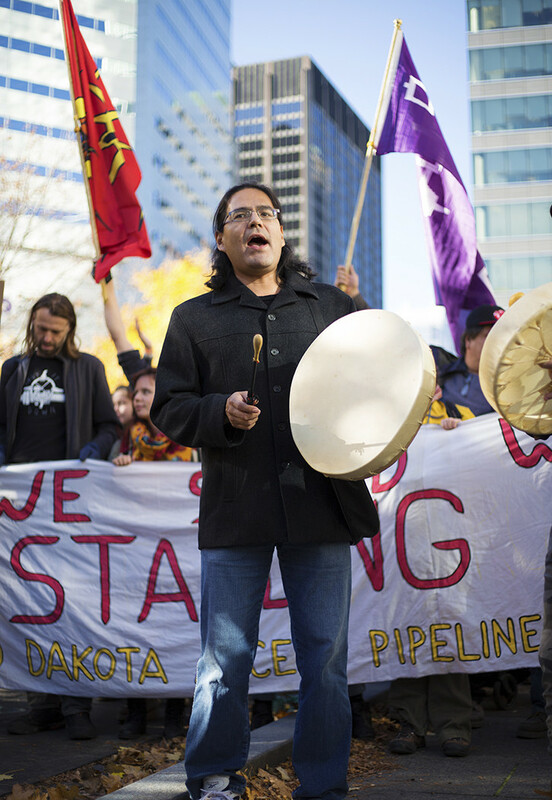 The pipeline was then rerouted towards the Standing Rock Sioux Reservation, triggering protests from the Indigenous community last spring which would eventually balloon into a mass movement. By late summer, the encampment in Standing Rock had grown exponentially. What began with a handful of occupiers on the reservation is now multiple occupation sites in and around Standing Rock. Over 100 tribes from across the United States and Canada have joined in the occupation. Direct action regularly shuts down pipeline construction. Police and private security have responded with overwhelming force. Since the escalation of conflict in late summer, solidarity actions have proliferated across North America. The protest in Montreal marks the first major demonstration of support for Standing Rock in the city. “They’re attacking water, they’re attacking my brothers and sisters, they’re attacking animals, women and children,” said Crystal Hooper, a participant in the protest, referring to the North Dakota police response to Standing Rock protests. When protesters arrived to the banks at Place Ville Marie, they were met with police lines blocking the banks’ entrances. Protesters complained that they weren’t allowed into the institutions despite being accountholders. RBC allowed protesters in one at a time, while TD locked the doors and prevented anyone from entering. Despite that, organizers say that protesters will continue to close their accounts with the pipeline’s financial backers in the days to come. Cara-Eve B. Basque, who closed her account, says that she hopes others will take the short time to do the same. Clifton Nicholas, an organizer from Kanehsatà:ke who was behind the barricades at the Oka Crisis in 1990, said that he is happy to see action being taken in solidarity with Standing Rock.